Nadim Naaman is one of those actors who has circled the edges of my attention without ever really demanding it – recently he was strong in Chess but didn’t make too much of an impact for me in Titanic (nor did the show itself tbh) but I do admire the industry of performers who make the decision to record albums that push beyond the too-oft-repeated collection of standards that people put out. 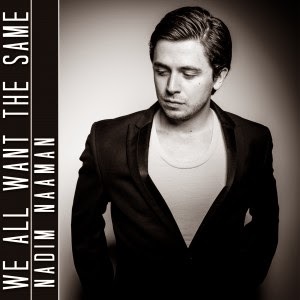 We All Want The Same is a collection of songs written over the last decade by Naaman and makes for an interesting collection of original material. Without wanting to sound too damning, the style is best characterised somewhere around soft rock and MOR pop. Formally, it may not be the most adventurous set of song-writing you’ll hear, rather, the emphasis is on a highly professional sheen of well-produced music that glides by across its 11 tracks. This gloss also relates to the lyrics which tend to generic pronouncements rather than specifically personal – this suits the album as a whole but in the hints that occasionally peek through, of the man behind the music, there’s a feeling that his song-writing could usefully dig a little deeper. Songs like the heartfelt ‘Amazed’ and the London bombings tribute ‘July 7th (For A Lost Son)’ reveal a palpable sense of emotion which is beautifully put forth with a pair of hauntingly restrained vocals. Similarly, Namaan responds well to a duet partner, both ‘Sorry’ with Siubhan Harrison and ‘That’s How It Goes’ with Will Barratt sparkle with personality as the collaborative spirit brings out the best in everyone. Overall, this quality makes it an album worth investing in as it is never less than listenable, but it would be interesting to see a follow-up collection written as a cohesive whole.